If you follow my blog you may have noticed that I haven't posted many new posts lately. Recently I experienced the loss of my sister and though I have been tying a few knots here and there, I just didn't feel up to the task of publishing any of them. I decided I would get back to publishing in hopes that it will help in this trying time. That's when I decided that my first post would be honor of her. 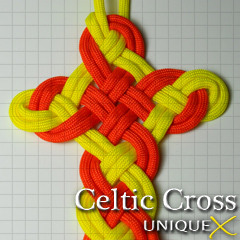 This knot is called the Celtic Cross and is really an attractive Cross. 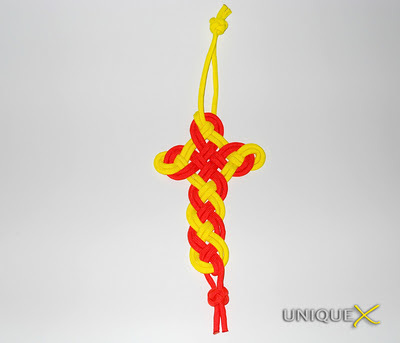 And though it may look challenging, it is really an easy design to tie. CLICK THE CONTINUE READING BUTTON TO VIEW THE REMAINDER OF THIS ARTICLE. I followed the instructions from Free-Macrame-Patterns.com to learn to tie the design. 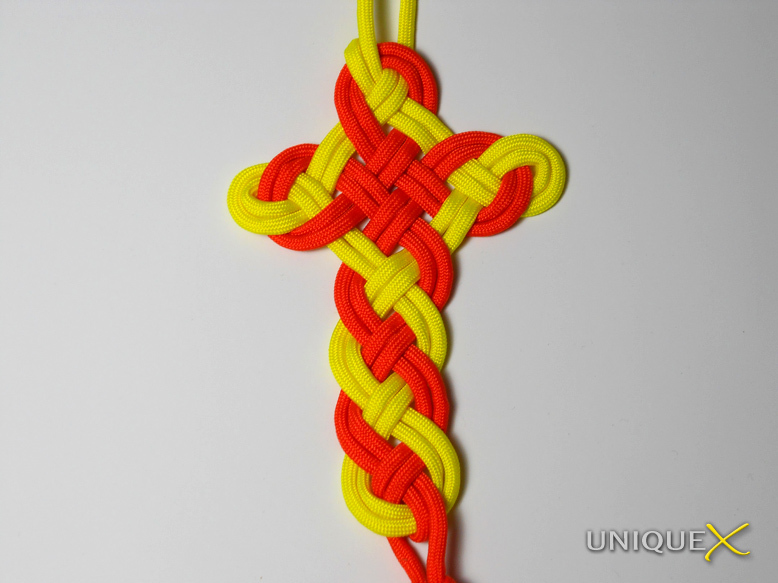 I tied the Celtic Cross using about three feet of paracord in neon orange and neon yellow. I followed the instructions for the first course exactly, but for the second I ran one of the strands from each color underneath the other color and followed alongside the single strand. I finished off the design with a Knife Lanyard Knot on either end. I have a trying time, too, due to losses in my life. For me it is trying time = tying time. I find tying and engaging in exchanging ideas strangely comforting. Sorry to hear of your loss, Chad. I hope that tying this helped bring you some peace. Thanks for the support, it's bound to be a rough road, but it's one everyone must travel at one time or another.